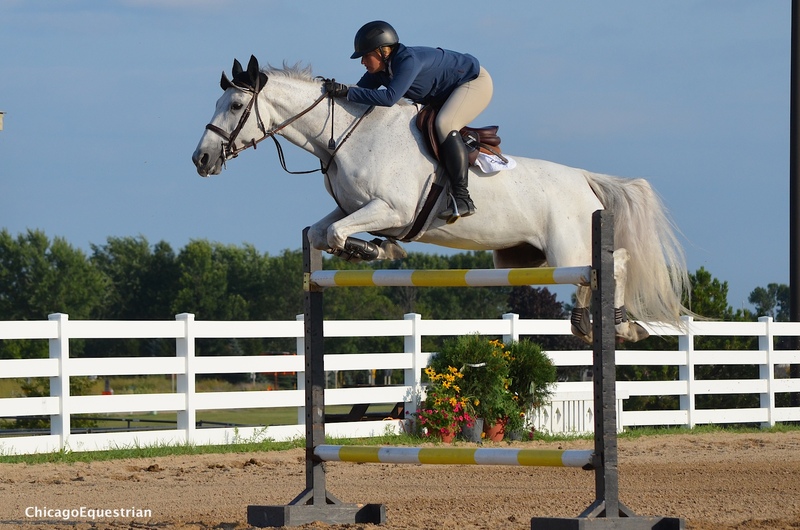 Serah Vogus won the Four Bar Class and the $2,500 Walsh Products Mni-Prix at the Wisconsin Equine Derby Weekend. 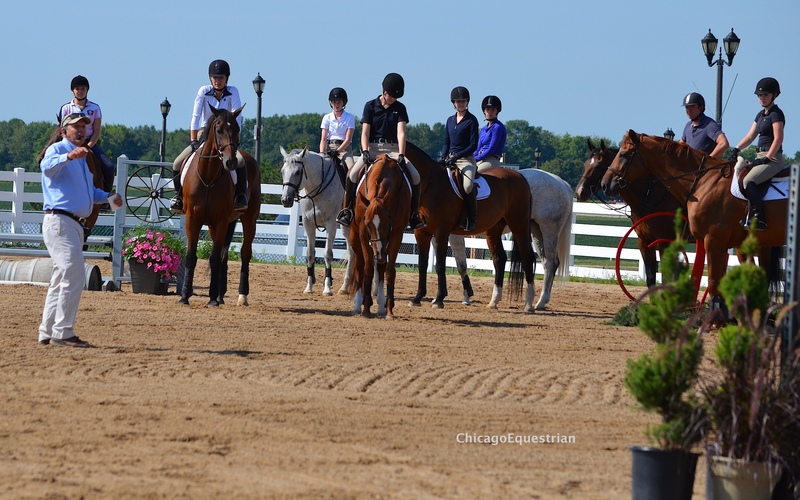 Photo by Abby Hutzler for ChicagoEquestrian. 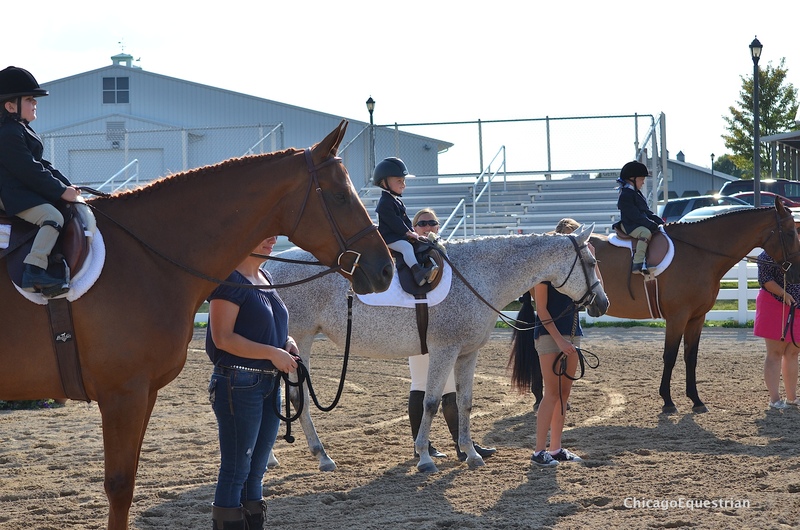 West Bend, WI - August 16, 2014 – Clinicians took to the rings to kick off the weekend at the Washington County Fairgrounds for the second annual Wisconsin Equine Derby Weekend presented by Old Seoul Equestrian and founder Courtney Hayden-Fromm of West Bend, WI. Friday kicked off the spectacular Derby Weekend featuring a day of education and two days of applying the knowledge to the show ring with a day of Hunter Derby competition on Saturday and Jumper Derby competition on Sunday. Diane Carney works on basics with gymnastic exercises. 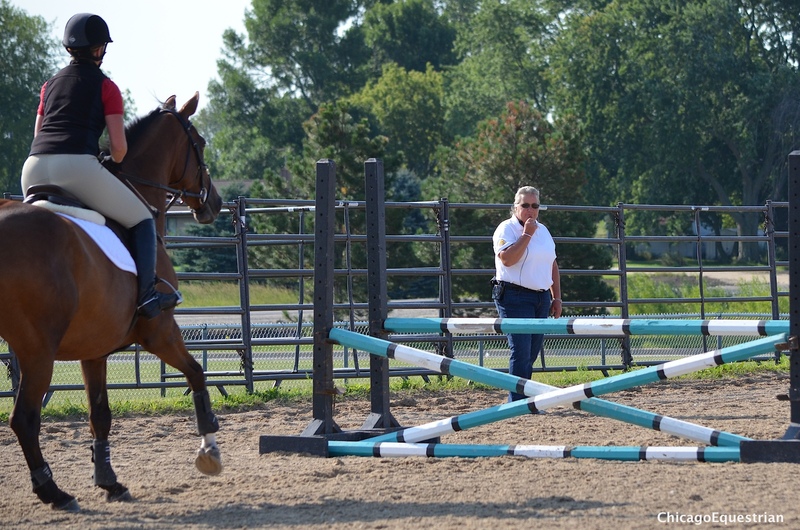 Clinician Diane Carney of Antioch, IL, taught more than fifty riders the basics for riding jumpers using gymnastics. Carney set a series of challenging exercises to teach basic principles of riding such as straightness and balance. Carney is a United States Equestrian Federation (USEF) R rated judge, who judges all levels of riding from the Winter Equestrian Festival to school shows and teaches clinics across the country. Steve Wall teaches riders how to ride a derby course. Steve Wall, of Santa Barbara, CA, is a former Wisconsin trainer and a USEF R rated judge, who also gave over fifty riders a judge’s perspective of what he wants to see from the judge’s booth. Riders had a chance to practice some derby riding skills as Wall talked about their importance in the show ring. Wall has judged some of the top horse shows in the country including the prestigious Chicago Hunter Derby last year. Ada Oldfather and Sydney Carpenter receive awards from Ann Bannister. 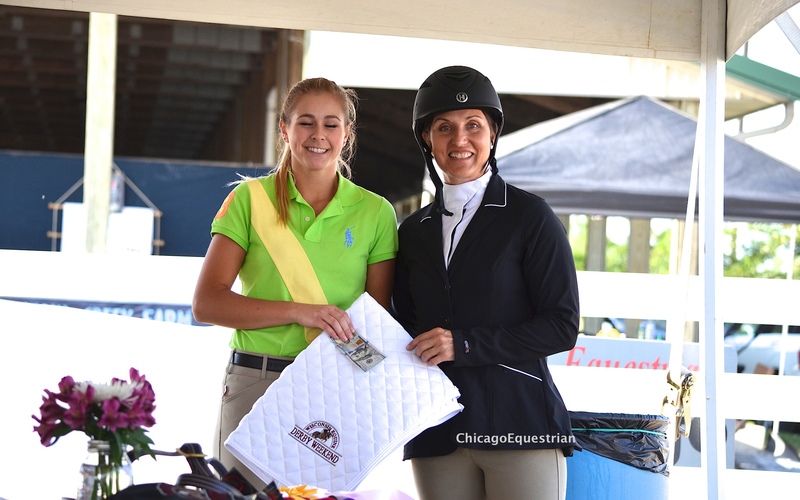 Two riders received Most Improved Rider awards courtesy of Ann Bannister and Entirely Equine. 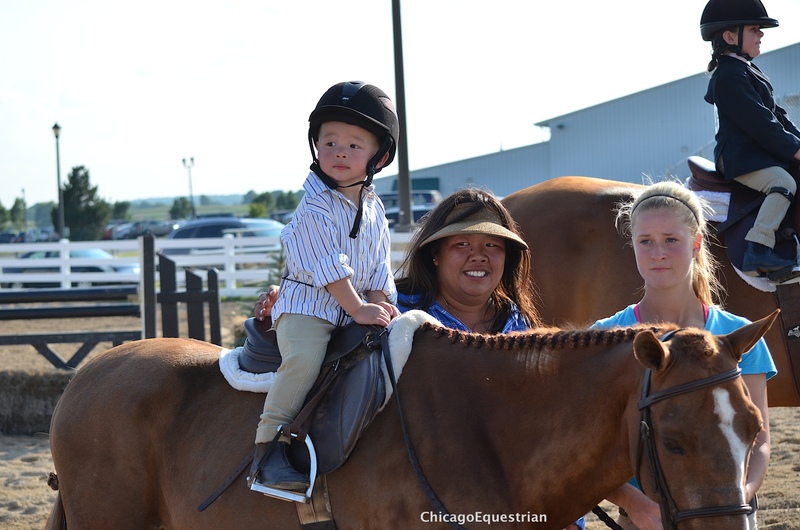 Each clinician nominated the rider they thought improved the most during the clinic. Wall nominated Sydney Carpenter, 18, of Waunakee, WI, and Carney nominated thirteen-year-old Ada Oldfather. Serah Vogus and Celestina won the Four Bar Class at 5'. 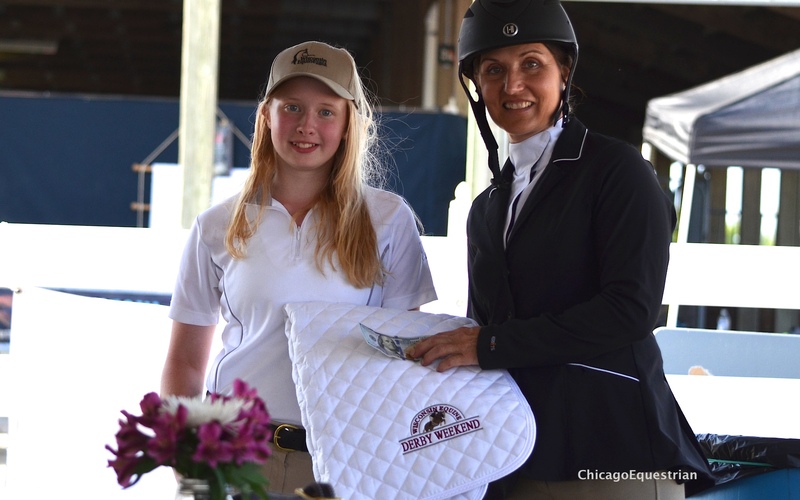 The highlight of Friday was a Four Bar Class sponsored by Rising Star Stable and a pizza party sponsored by ChicagoEquestrian.com. Twelve riders tried their luck as the combination grew bigger and bigger. Serah Vogus and Celestina and Elizabeth Rietsel-Karlan with Aine were the final two pairs, both having a rail in the final round. Determined to have a winner, they decided to jump off to break the tie. In the end it was Vogus who cleared the 5’ obstacles without fault for the win. With Carney and Wall as the judges for Saturday's competition, riders could now practice what they learned from the clinic sessions. 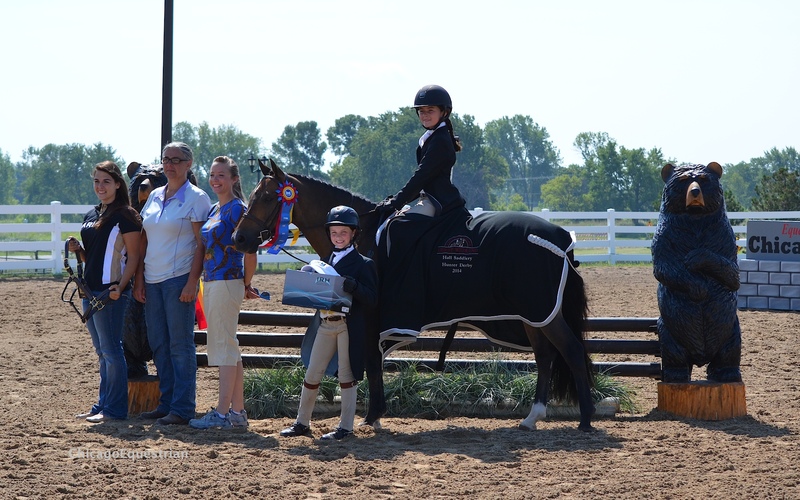 Starting off Hunter Derby Day with a win in the $500 2'3" Hall Saddlery Hunter Derby sponsored by Hall Saddlery of Sussex, WI, was Hannah Hoch of Whitefish Bay, WI with her pony, Playwright. Hoch has had the pony for five years and already has five derbies under her belt with today’s win. Hannah Hoch and Playwright receive their award from Hall Saddlery Sponsors and an IRH representative. Jennifer Welhouse and Havin A Supreme Time with LeCheval's Mary Pratt presenting with the IRH representative. 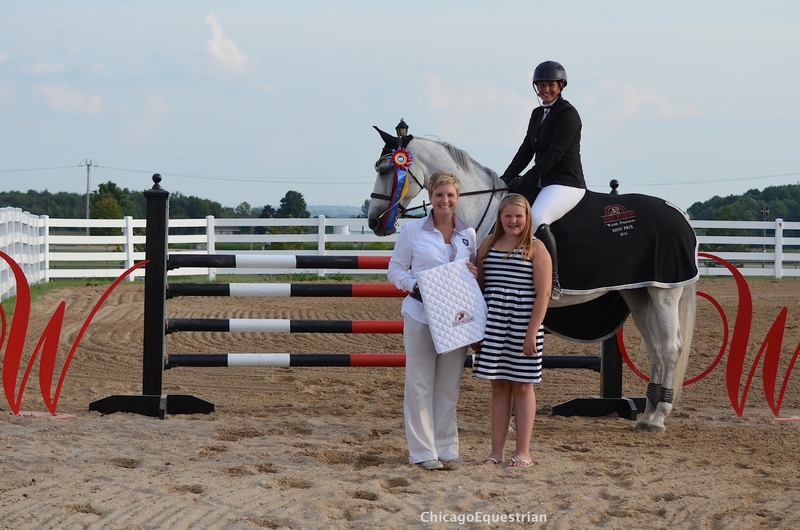 Winning the $500 2’6” Le Cheval Hunter Derby sponsored by $500 LeCheval Tack Shop, Oconomowoc, WI, out of 30 riders was was Jennifer Welhouse and Havin A Supreme Time. Melissa Plemmons and Kim Mathy's Raquel receive their award from Emily Elek. 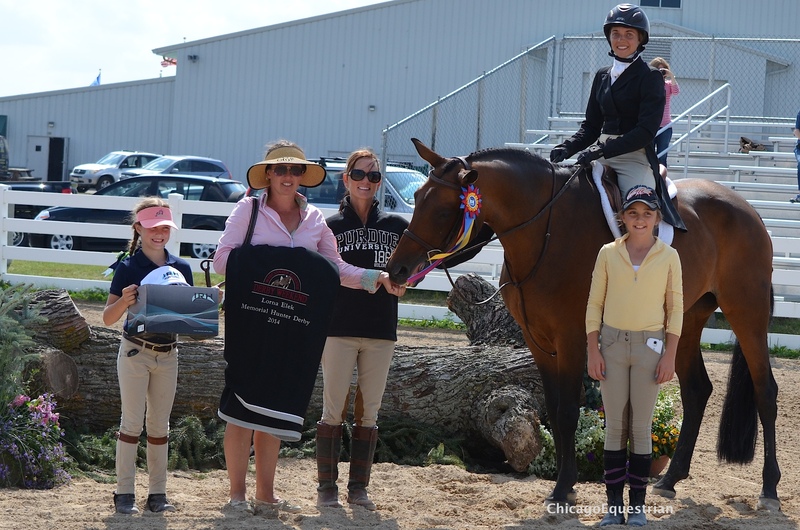 Melissa Plemmons of Lacrosse, WI won the $1,000 3’ Lorna Elek Memorial Hunter Derby sponsored by Emily Elek, with Kim Mathy’s Raquel. Plemmons earned an 86 in the handy for a one point overall lead over Lane Nygren of Oconomowoc, WI and Jessica Kupser’s Romeo. 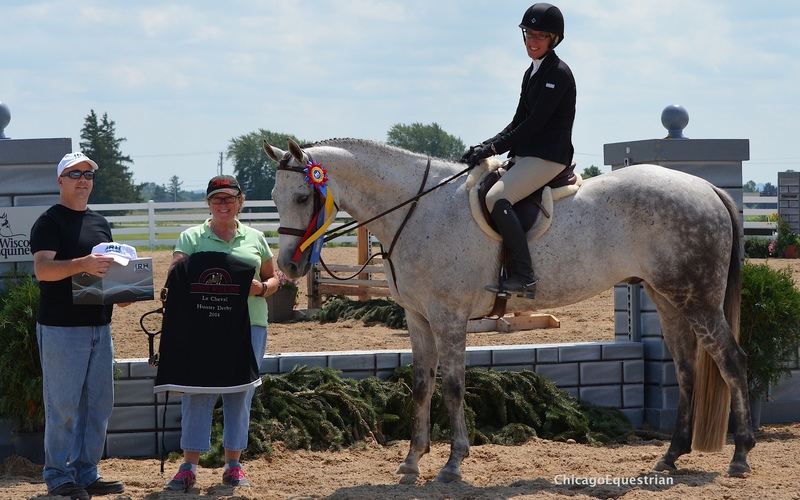 "Courtney (Hayden-Fromm) does such a great job with this horse show," said Plemmons. "It's a fun event and a great chance to get experience. The riders and owners have a great time and I thank Kim Mathy for the ride on Raquel. She is such a great horse, it's a pleasure to get to ride her. Nothing fazes her so you know she's always going to do her job." Owner Claire Simpson rides Bonfeuer for the blue ribbon for Serah Vogus. 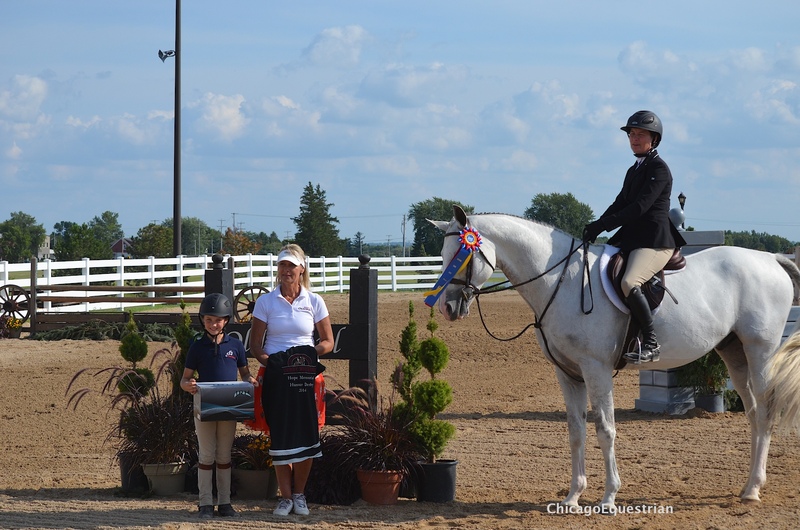 Winning the $1,500 3’6” Hope Memorial Hunter Derby sponsored by Seoul Creek and Courtney Hayden Fromm was Serah Vogus of Antioch, IL with Claire Simpson's Bonfeuer, who had a great handy round which put them in the lead. Serah Vogus with Walsh Products sponsors Thea and Lauren Treiber . Vogus continued her winning streak in the $2,500 Walsh Products Mini Prix by being the only clear round with Celestina, earning her the blue ribbon. "Courtney has put together such a great event here," said Vogus. "Last year I came with three clients and they raved so much afterwards that this year I had ten. The weekend is educational, fun and rewarding. It's a great opportunity for people to get their feet wet in a derby or move up a level. The generous sponsors provide great prizes and the courses are fun. After the clinics on Friday, everyone goes into the ring feeling confident and excited to play. For these reasons, this event has become a permanent part of my show schedule." Exhibitors could take an afternoon break and enjoy the ice cream social sponsored by Stonewall Ponies or custom paint Breyer horses, courtesy of Hall Saddlery. 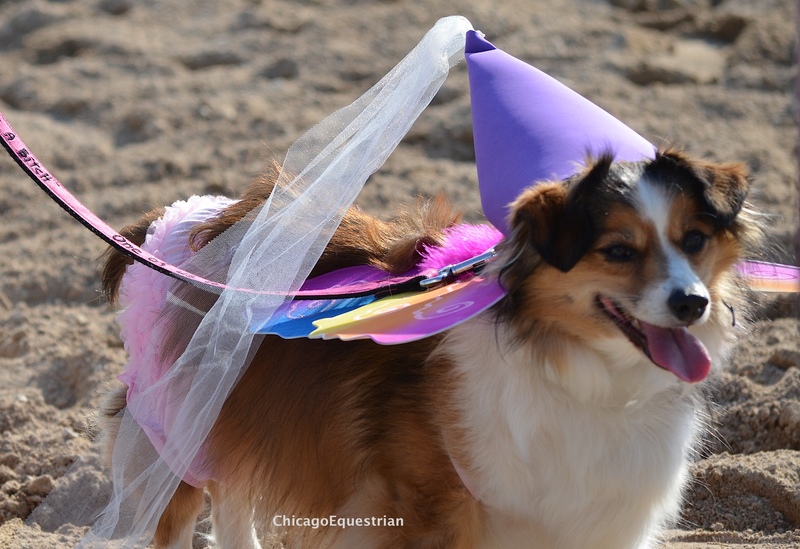 The day finished off with an adorable dog costume class, the Barbara Biever lead line class and a parade of champions. Topped off with great food for the exhibitors party sponsored by Wisconsin Equine Clinic & Hospital. Leadliners suited up for the occasion. Old Seoul Equestrian founder Courtney Hayden Fromm donated the proceeds for schooling and the lead line class to the Griebel Family Fab 5(Germantown WI) and Triple K Horse Farm Tornado Relief(Madison WI).